Our latest completed project from Distributed Proofreaders is the second to come from the Instructor Literature Series, following Stories of Robin Hood. This title, More Stories of the Three Pigs, is aimed at a fairly young audience. 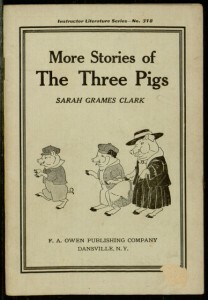 The title is slightly misleading, as readers familiar with the original story will recall that two of the three original pigs were devoured by the Big Bad Wolf. This book resolves that problem by giving Mother Grunty (the original survivor) a pair of children. While this story fully acknowledges the darker elements of the original tale (including the detail that Mother Grunty killed and ate the Big Bad Wolf at the end of it), it consists primarily of quiet stories about childhood activities (and mischief), creating a somewhat incongruous whole. The entire illustrated book of stories can be read online or downloaded through Project Gutenberg.